In conjunction with the Music From the New Wilderness concert presentation, sound artist Jenni Schine will be presenting an intimate audio installation based on her conversations with Billy Proctor, a lifelong resident of the remote Broughton Archipelago area. Schine’s installation will be located in the Founders Lounge at The Cultch, and will be accessible during the Feb 11 – 15 performances from 7 – 8 pm and during intermission, and also during the Feb 15 matinée from 1 – 2 pm and during intermission. For those who are not able to attend the concerts, Schine’s audio has been made available via SoundCloud for the duration of the show. 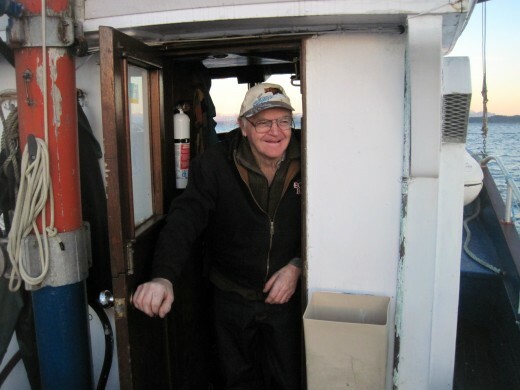 Since 2009, I have been audio recording the sounds from the Broughton Archipelago and the stories of pioneer Billy Proctor. As an elder who has witnessed the transformation of British Columbia’s coast, he is known as an important knowledge keeper and “the heart of his community”, a community called Echo Bay. These recordings from this particular place are not only historical records or material for audio art; they also act as an invitation for people to listen to the world around them. Such listening is an opportunity to redefine human connection and reclaim sacred spaces, including the places we call home. It’s not easy to live off-the-grid on the coast of BC. Wood needs to be chopped, water lines fixed, and specialists, plumbers, and the nearest hospital are an hour and a half boat ride away. For Billy, it’s pretty quiet in Echo Bay. But actually, there are a lot of sounds, if you listen. What happens when we internalize an obligation to place? Does place belong to you—or do you belong to place?